September 1973 FAVO received approval to build the second RS Capri, the Capri RS 3100 was to be built at Halewood. A total of 250 cars were built there during November 1973. These cars featured many of the parts used on the last RS2600 ie. – Brakes, suspension (although the spacer/ lowering block was in a different position on the RS3100 raising the ride height at the rear), wheels and front spoiler, it was also fitted with an overbored Essex 3000 V6 resulting in 3,091cc producing 148bhp and 187lb/ft of torque at 3000rpm, capable of propelling the RS3100 to a max speed of 124mph and 0-60 in approx 8 sec. The RS3100 also featured a unique Ducktail rear spoiler, a part that was desperately needed for motorsport and made a distinct improvement to stability at high speed. These rare cars were only available in seven different colours, Daytone Yellow, Sebring Red, Diamond White, Modena Green, Olympic Blue, Stardust Silver and Marine Blue, they all had gold decals similar to the RS2600 but with the words deleted from the bootlid, no rear quarter roundals but with the addition of a triple coachline to the sides. At the time the RS3100 was launched the cards were stacked against it being a marketing success as the new MK2 Capri was waiting in the wings, there was an oil crisis and it was very expensive at nearly £2,500, the car proved very difficult to sell, this led to 50 cars being exported to Australia in June/July 1974. There were also 22 cars registered by Ford for the use of there Area Sales Managers to try and push sales most of the time at heavily discounted prices. 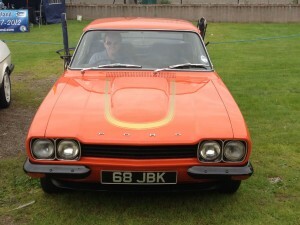 The RS3100 was based on a standard Capri 3000GT, there were no options available, the only differences were that some cars had White needles on the dashboard (as Mk2 Capris), others had red. Some cars were fitted with static safty belts (most) others had inertia type and some had leather type gear knobs others had plastic. I guess these items were so insignificant at the time they would have used what ever was in the parts bin at the time rather than hold up production. There is one RS3100 that differs from the rest, a Sebring Red car KVV648P, this is the car that was used for studio shots as used on the Supplementary Handbook and the Sales Brochure, as this literature would have all been completed by the time the first production cars were built it is fair to assume that it is almost certainly one of the six pre-production cars built. It differs from the rest as it has a three spoke steering wheel, black rocker covers (all the others were blue), it also has a fixed rear quarter windows and a unique chassis number BFECRK, all of the others start BBECND, this unique car was also the last RS3100 to be registered hence the “P” registration.